Panel Cleaner - Material Cleaner | Black Bros. The Black Bros. 495 Panel Cleaner ensures that the substrate is free on both sides of any dust or embedded chips prior to gluing or coating. This helps maintain a consistent, high-quality bond and reduces scrap in your laminating, finishing, or veneering operation. Models range in sizes from 38″ to 74″ (660 mm to 1879 mm) brush lengths, and use long-wearing 6 1/2″ (165 mm) diameter tampico fiber brushes to provide a vigorous, deep, and thorough cleaning to both the top and bottom of the panel surface. The compact design, with hoods enclosing the entire brush, facilitates a highly efficient airflow system for maximum dust pickup and better conformance to today’s OSHA and EPA regulations. Ask about a specialty configured panel cleaner to clean raised panel doors, office furniture panels, display components, etc., before processing in a membrane press. The PC-3D is the only machine designed specifically for the 3D Laminating marketplace. Reduce your footprint while improving your cleanliness. 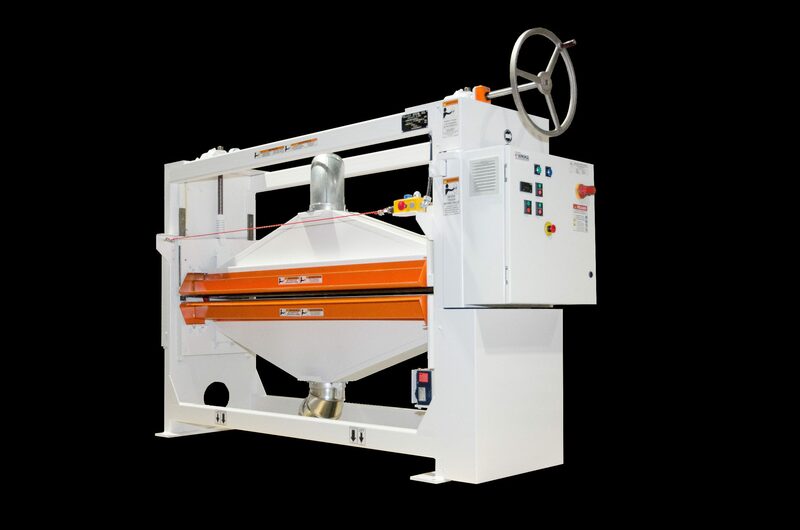 The PC-3D cleans components on all 6 sides in a simple pass-through format (conveyors included).